First of all, let’s talk about old favourites. Nostalgia drives the retro gaming hobby, and while sports gaming comprises a niche demographic – whether we’re talking old games or new ones – there are older basketball gamers who treasure the titles they played when they were younger, and get a kick out of playing them again. Indeed, in some cases, they may even be a little better than you remember! You don’t have to be a thirty-something to be nostalgic of course, but the older you are, the more changes you’ve experienced in gaming, and the further back your early basketball gaming experiences extend. 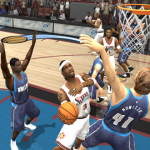 NBA Live 95 is a tad more retro than NBA 2K10, for example. Needless to say, not all games hold up extremely well, and even the best sim-oriented basketball titles of years gone by can seem a bit disappointing after playing their more advanced successors. As such, some of them may be fun to revisit, but not to spend a lot of time with. That said, if you can look past their flaws and more primitive technology, a game that you’ve spent a lot of time with can draw you back in with its familiarity. If you have still have an old saved game that you can pick up again, it might even find its way back into your gaming rotation, at least every so often. Two games that I can go back and play are NBA Live 06 on PC, and NBA Jam Tournament Edition. While I’d describe both as excellent games for their era, they have been surpassed by the games that have followed them. 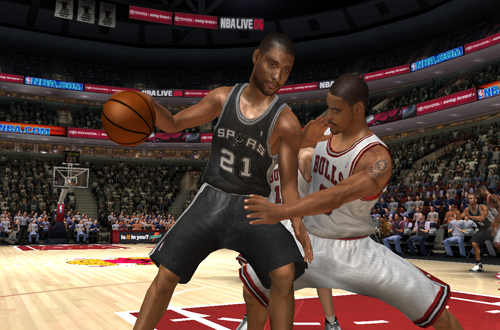 In terms of the sim-oriented games, NBA 2K is currently setting the standard; for that matter, NBA Live 16 does some things better than NBA Live 06, simply because there’s better tech to work with. Likewise, NBA Jam: On Fire Edition’s Real AI made it a significant improvement on pretty much every arcade hoops game before it. 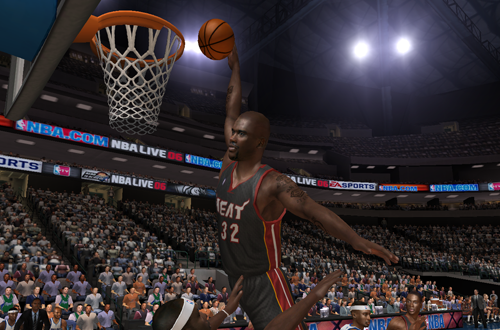 All the same, NBA Live 06 and NBA Jam TE were quality releases, and I can still enjoy them. Bottom line: while I think highly of those games and can still play them, I wouldn’t describe them as the pinnacle of basketball gaming, considering the titles that have come after them. However, there are some gamers who staunchly insist that an older game still reigns supreme. Now, I’m not about to dismiss anyone’s opinion out of hand, and it’s also fair to say that hoops games don’t necessarily get better every year. They can take a step backwards, or at least feature a design choice that doesn’t work out as well as planned. After four or five years though, it’s a safe bet that a good sim-oriented basketball game will be surpassed by another. A vocal contingent of gamers considers NBA 2K11 to still be the best game in the NBA 2K series, an assertion that I respectfully disagree with. It’s admittedly a longer debate for another time, but in a nutshell, while I do think it was a landmark release and a great NBA game in its own right, I wouldn’t say that it’s better than every game that’s come after it. 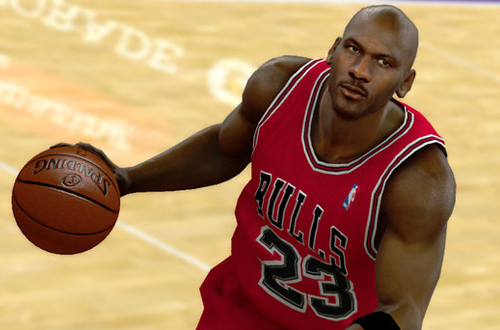 Graphics, controls, depth of modes, AI…you name it, 2K has made improvements since then. Obviously, there is bias here on both sides. If you like some of the bigger changes 2K has made in recent years, you probably won’t favour 2K11. If you don’t care for those changes, then it may still be the game for you. It’s a contentious issue. Newer isn’t always better, we tend to stick with what we like, and we also tend to treat our own opinions as facts. Whether we believe the latest game or one from a few years ago is the best, we’re probably not going to be swayed from that belief. As long as we’re respectful of each other and can agree to disagree, there’s certainly no harm in a difference of opinion. Furthermore, if you can’t afford a new console or PC, you’re kind of stuck anyway. If you don’t have any way of playing the most recent games, then it’s a moot point. But beyond nostalgia, different tastes, dissatisfaction with newer releases, or being unable to upgrade your gaming hardware, is there another reason we either stick by or go back and play older basketball video games? I believe there is. I believe that it comes down to realism…or a lack thereof, as the case may be. On the whole, most of us want to see realistic, sim-oriented basketball games. After all, we certainly have a lot to say when we feel a game doesn’t live up to our standards in that regard. But as I’ve discussed before, I’m not sure that we’re always completely aware of what realism truly means for basketball games. We haven’t always adjusted our gaming strategies to account for the increase in realism in newer releases; we’re still trying to do the things we used to do, when the games were simpler. As a result, at times we’re ironically prone to declaring the newer games to be unrealistic, because we’re bothered by realistic elements that make them more difficult. Returning to an older basketball game, or sticking with it over a new release, presents us with familiar experiences where we can often win more easily. As gamers, that appeals to our desire to master and beat the games we play. With basketball games becoming more sophisticated and realistic, their difficulty and subsequent need for a more strategic approach to gameplay has also increased. That’s not a bad thing, but I think it’s caught some basketball gamers by surprise. An older game might seem “better”, because there’s no longer a learning curve to beating it. Alternatively, some gamers may prefer a more casual approach to the sim style. The older games, usually being a bit simpler and less realistic, better cater to that preference. And you know what? That’s absolutely fine. Whether you’re dusting off an old favourite for a trip down memory lane, or sticking by an older release because it appeals to you more than a newer one, the important thing is that you’re having fun. We do take basketball gaming seriously around these parts, and that’s not a bad thing. We want the games to be great, and we want value for our money. However, we should avoid getting caught up in the petty aspects that often afflict gaming culture: arguments over difficulty levels, which game is the best, the supposed one correct way of playing the games, and so on. Trivial arguments, when it comes down to it. We should be enjoying these games, and having fun with them. So by all means, dig out those old basketball titles for some retro gaming, or keep playing a game that’s a little dated if it offers the most enjoyable experience for you. Just keep in mind that modders will move on after a little while, and the longer you play a game, the more that’s going to become an issue. Also, maybe avoid Bill Laimbeer’s Combat Basketball. I mean, to each their own, but if you’re going to go retro, I’d advise sticking with a true classic.